1000%: Liquidity Crunch in the Turkish Swap Market. What future for the Lira? Over the course of its history, Turkey has been continuously striving towards beneficial economic relations with Europe. Turkey became an associate member of the European Economic Community in 1963, and later joined the Customs Union in 1995. As a result of a period of very high growth and sound managing of public finances, it was eventually awarded Investment Grade rating by all the major providers starting between 2012 and 2013. In 2005 Turkey started negotiations to join the European Union, which were ultimately halted by the European Parliament in 2017 following the controversial referendum which abolished the position of Prime Minister and broadly enlarged the powers of the President, ranging from creating and regulating ministries to the decisions regarding the government budget. Since then Turkey’s economy has taken a huge hit (see table below). The country has historically been running significant current account deficits, for which the funding came via capital inflows particularly from major European countries. In the Summer of 2016, the attempt of coup led to fear and sudden capital withdrawals from Turkey by foreign investors, and the ensuing mass purges of those allegedly involved didn’t make improve things. Additionally, Erdogan was openly expressing his discontent at the central bank’s rate hikes policy. However, this was necessary given the significant devaluation expectations among the population and the ever growing dollarisation of the economy. 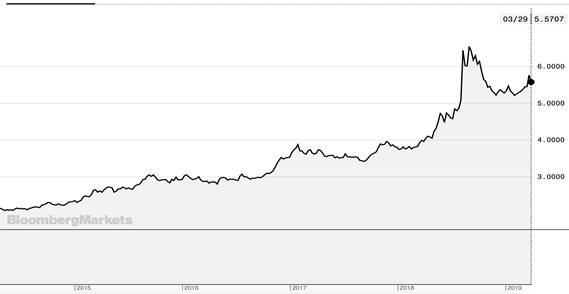 It is worth noticing, for instance, that the Turkish currency went down from 1.5 TRY per US dollar in the aftermath of the financial crisis to just below 4 TRY at the onset of 2017. This had an adverse effect on the asset quality of the major financial lenders. The initial round of devaluations led to major Turkish corporations experiencing financial difficulties in the first half of 2018. Firstly, they were prompted by president Erdogan’s pressure on the central bank not to increase interest rates, this seriously undermining the independence of Central Bank of Turkey. This caused a massive loss of credibility for the Turkish currency by the whole market, which grew increasingly doubtful over the ability of the central bank to conduct properly monetary policy. President Erdogan viewed raising interest rates as something which could harm the economy. Moreover, corporations such as Yildiz Holding, Dogus Holding and GAMA Holding sought to restructure as much as $12 bn of debt in total. On May the 28th, the Turkish Central Bank raised its repo rate from 8% to 16.5% in order to stabilise the falling lira. On July the 5th, Bloomberg reported the news of the default by Turk Telecom and that major creditors were taking control over it. This was the biggest default in Turkey’s history. Turkey’s inflation rate accelerated to unpredictable levels, and between May and August it rose from 12.2% to 18% , the highest level in 15 years. In this period, Moody’s downgraded 20 financial institutions following considerable deterioration of the economic situation. In the first half of August, Erdogan publicly denounced US and decided to limit the use of US consumer goods and the use of credit cards. At this point in time, lira lost 10% of its value. On August the 30th, the deputy governor at the central bank resigned sending lira falling 5% in one day. In September, the central bank had to, contrary to Erdogan’s will, hike the rate twice making it 24% which helped prop up the value of currency. In this article we are going to talk about the effect of the sudden liquidity crunch which occured this week in the london swap market for turkish lira, as well as a brief recap and analysis of Turkey’s macroeconomic situation. A currency swap involves an exchange of cash flows received by interest on a domestic currency and cash flows received by interest on a foreign currency. Everyday at 5 PM the market rolls over and the investor is credited (or debited) the rollover rate on the operation in which he engaged. The rollover rate is given by the following formula. Where the Base Currency is the currency on which the investor has gone long on and the Quote Currency is the currency on which the investor has gone short. Hence if the interest rate of the foreign currency is higher than the domestic currency the rollover rate shall be positive (which implies a gain for the investor) and vice versa. In normal times, such interest rates are not super dissimilar from overnight interbank rates, as national banks provide liquidity to the market. As the news was released on Thursday, that foreign currency reserves fell around $10 bn (29% of total value) in the sole month of March, suggesting that the latter was being used to prop up the Lira temporarily before the municipal elections taking place on the 31st of March, a sharp depreciation of 5.35% occurred to the lira. However, this was blamed by Turkish political representatives on J.P. Morgan’s piece of research which suggested to get out of the lira. They also said this move was part of a conspiracy by the USA to hurt the Islamic country by giving “misleading” and “manipulative” advice, and Erdogan stated on Sunday that the banks responsible for the speculative attacks against the lira would be punished. Nevertheless, this threat led to growing anxiety for lira investors Triggering memories of the previous year’s significant currency crisis, the Turkish government decided to heavily discourage banks from providing liquidity to foreign investors. Some investors reported having trouble even in simply finding liras on the market: Those who held short positions and wanted to close the trade were forced to sell lira-denominated assets to find the required liras, causing a 200 bps rise in bond yields and a fall of 5.86% in the Istanbul 100 index and CDS jumped to over 450 bps. Interestingly, by sacrificing the value of other assets the spot rate of the lira was able to rebound at least temporarily by 6.8% compared to US dollar between saturday and wednesday. After that the lira moved downwards 3.3%. It is important to view the recent events in light of the upcoming municipal elections in Turkey. It is very probable that the whole policy of freezing short sellers has been done in order to temporarily gain popular approval with the electorate, which would have reacted badly to another depreciation. Such elections are considered very important in Turkey as they will be interpreted as a sort of “referendum” over the public opinion reaction to Erdogan’s new powers. Also a government official has been reported to say that such measures are temporary and Turkey is committed to free-floating exchange rate by Bloomberg. In fact, those policies, while beneficial for the lira in the short run, have been viewed by the market very negatively: the market unfriendliness of this move has led to a dramatic increase in CDS rates, which can be viewed as investors being worried about the longer term outlook for the country. As for most currency crises in emerging markets one of the main problems for the economy is the great amount of borrowing that firms do in dollar denomination. When a significant depreciation of the domestic currency occurs, servicing debt with lira revenues becomes harder and harder. In this more specific case, capital controls and market frictions usually result in a loss of credibility in the currency and the central bank. As we have seen before Turkish households seem to not believe in the value of the lira, and this act by the government may exacerbate those fears. Finally, if the pace of loss of official reserves which occurred in March is not stopped, further depreciation is unavoidable. On the other hand the Turkish central bank and government were more effective than Argentina in stopping the depreciation of their currency and minimizing GDP recession, despite the Argentinian government acting in a more market friendly way and fully collaborating with the IMF. Not only that, but the fact that the fed will not allegedly rise the interest rates on the dollar, should help in securing a better value for the lira. A very important figure to look at is the inflation rate, which in Turkey has been slowly decreasing from the height of October 2018 (25.2%) and has settled to 19.7% in March as a sign that the interest rate hike of September by the Central Bank of Turkey which set the one-week repo auction rate at 24 percent was received positively by the currency. This is in contrast with what happened in Argentina where in spite of rate hikes the loss of confidence in the value of the peso led to an increasing inflation which has stabilised around 50% in the recent future. Hence, by mixing those data we can see on the one hand a mixed signal, in which the many frictions created by the political sphere to the proper functioning of markets and monetary policy resulted in a heavy credibility loss, with foreign money more unlikely to be invested in Turkey in the future. FX reserves have been depleted from a high of over $110 billion in 2014 to $73.8 billion last week, higher than August 2018 but still near 10-year lows. Furthermore, the temporary stop to short-selling the lira might make the outcome abrupt when such a friction is deleted. On the other hand, the falling inflation rate and the possibility by the central bank to hike further interest rates might prove useful for a rebound in the mid to long term, when all political factors will be properly discounted, it might to be an undervalued currency given the heavy losses suffered in last two years and the not equivalently bad hard data. What would be tremendously needed is a restore of confidence. As a trading strategy, given the limitations of further shorting the currency, one way to construct the trade could be via the bear call spread. The bear spread would allow us to have low exposure to volatility, which is now priced in by the market, but instead be delta-negative on the Turkish currency. On Friday, lira closed at 5.58 TRY per US dollar, and it was ranging in the past month between 5.34 and 5.76 TRY per US dollar. In our case, we would go long 5.48 lira option and short 5.68 lira option both with 1 month’s maturity. In the meantime, we would be closely monitoring the upcoming news of the March inflation rate, January unemployment rate and the central bank’s target rate decision, which could surprise the market in the following weeks.